Meredith is amazing! She did the flowers for our wedding and I couldn't have been any happier with the result. By just showing her a few pictures of the vision I had, she understood it and made it come to life! The flowers were fresh and absolutely breathtaking. I know most people say they never remember flowers from a wedding, but I am still getting compliments from my guests about them. They couldn't believe how beautiful they were. Meredith is so fun and so easy to work with. She is also extremely creative and will work with you and come up with great ideas for what you are envisioning. She is always prompt with responding to questions, etc. and is very detail orientated. She is by far the best florist on the Northshore! You will not be disappointed in hiring her. I just wanted to thanks again for making our wedding day so beautiful! Working with Meredith was one of the easiest decisions we made while planning our wedding at Willowdale Estate. After meeting with her I knew right away that we found the perfect florist. In addition to being extremely knowledgeable and incredible creative Meredith has a way of putting you at ease and making you feel worry free about your wedding day. It was amazing meeting with her, showing her a picture of what I wanted for my bouquets and centerpieces and then seeing an even better version a few months later on my wedding day was incredible, she is truly talented! She is very patient with last minute changes and also provides creative ideas when you just can’t seem to make any more wedding decisions. At Willowdale cocktail hour is inside where they have an incredible mantel and shelves next to the fireplace. I knew I wanted pictures on the shelves but really could not think of what else to do, I was stuck. Meredith came up with idea of doing some floating candles in bubble bowls and some with a floating rose. It looked amazing! The floating rose tied into my color scheme and was very fitting for the setting. After hearing her suggestions and ideas I left it up to her to put whatever she wanted on the mantel at Willowdale. I cannot begin to say how many complements we got on the mantel arrangement, it was beautiful. . It was nice to have a florist that was familiar with the venue and knew exactly what and where you needed arrangements. I was impressed when Meredith knew the number of tables at cocktail hour off the top of her head! It was a relief to work with someone who is trustworthy and you know will put all their effort into making your wedding day perfect. Everything was so thoughtfully and beautifully done and exceeded my expectations. My own bouquet was gorgeous, just perfect; it's one of the highlights of the wedding photos. In fact, the flowers are a big part of the reason why our wedding pictures came out so beautiful. Countless guests complimented our centerpieces; people were racing to tables at the end of the night to take them home. Those who did take home flowers were commenting on how long they lasted after the wedding. After such a positive experience from start to finish, I can't help but recommend Meredith McCarthy Floral Design. Meredith did the flowers for my wedding in October and she far exceeded all of our expectations! Even though my wedding was in October, we decided not to go the traditional "fall" color route and opted for more neutrals, blushes, whites. It was really nice that she wasn't pushing me into something more traditional. Meredith was super excited about my ideas - but when I had an idea that wasn't the best, she gently suggested other options that might be better. It was really nice to have her suggestions and ideas too! There were some things I just never would have thought of on my own! Meredith was very thorough in our meetings and with our phone calls. She takes the time to meet with you one on one and listens to your thoughts and ideas. Don't forget to bring inspiration pictures of what you think you want - it is really helpful!! Ok, let's get to the flowers! I was in awe when I walked into our venue and saw all the flowers set up. I had an idea of what it was going to look like, but it looked a million times better than anything I could have imagined! The centerpieces, my bouquet, the boutonnieres, everything was just above and beyond! The flowers so were fresh! My bouquet lasted for over a week and a half after the wedding!! My parents were giving away the centerpieces to our family and friends at the end of the night and people we in shock that they got to take something like that home with them! 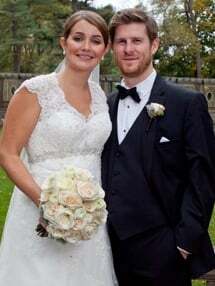 Meredith McCarthy did the flowers for my brother and sister-in-law's wedding and I was so happy to hear she was willing to take on our wedding. Meredith came to our first meeting with lots of ideas based on photos that I sent her per her request. Unfortunately the original flower I wanted was out of season, but Meredith had suggestions to make it work with what was available. The flowers were incredibly gorgeous and I firmly believe were some of the most beautiful bouquets and centerpieces I have ever seen (and we had three centerpieces per table). Originally, the floral plan was well over what we previously discussed and our budget, but Meredith was able to work with us so that the cost was within budget. Meredith also took on some last minute aisle marker requests. I was so sad that we were leaving for our honeymoon right away because I wanted to be surrounded by her floral arrangements more. All the flowers: bouquets, boutonnieres, mother flowers, center pieces, aisle markers, were as beautiful as ever and I would recommend Meredith in a heart beat. I had no concerns that the flowers wouldn't be what we discussed. She did an incredible job and was well worth the money we spent. Thank you so much for the most beautiful, fresh and perfect flower arrangements ever. They were so beautiful. They surpassed any ideas or expectations that I had. My Bouquet is hanging in my living room. They dried out so nicely and I will be able to cherish them forever. The centerpieces were amazing. Everyone fought over them when it was time to leave the reception. My mom’s (centerpiece) was still alive even after I came back from our honeymoon! Thank You for being so accommodating when I made those last minute changes too. You made me feel like there was nothing to worry about. It was so nice to arrive at the estate and all the flowers were ready for everyone and the tables were set. I can’t thank you enough for the great job you did. The flowers really were perfect, right color, texture and theme– everything. Thank you Meredith. I just wanted to thank you SOOOO much for the beautiful flowers! You did such an amazing job. I knew they were going to be beautiful, but they came out even MORE beautiful than I could have imagined. I love them. I still have all of the bouquets in water, and a few of the centerpieces are in our house. They still look great! And those arrangements that were on the pillars—AMAZING!!! I cannot get over how awesome those flowers were. I can’t even begin to tell you how many compliments and “wows” we got on the flowers—everyone thought they were gorgeous! Thank You again for the amazing bouquets and altar arrangements. They were exactly what I wanted, yet far more gorgeous than I envisioned. I could not stop looking at them and talking about them!! You are a very talented young lady! Good Luck with the business. I owe you a proper handwritten Thank You, but I can't help but send you a quick email letting you know how spectacular and beautiful ALL of our floral arrangements were for our wedding. The bouquets to the boutonnieres to the centerpieces to the pew arrangements were FANTASTIC. You understood exactly what Tom and I wanted for our wedding day- it was beautiful!!! Thank you so much for making such beautiful flowers for my wedding day, 7/25/09! The roses and calla lilies were awesome together! We had a sunny day, and great company - everyone loved my bouquet! I will continue to recommend you to friends and family! Thanks again! I wanted to say thank you so much for the wonderful job you did on my flowers. They were beautiful and the girls and I LOVED them! Not only was I impressed with how the bouquets looked but also on how the flowers were handled as far as the delivery and the packaging ... everything was professional and on time. I look forward to passing your name on and contacting you for every other occasion that flowers are necessary! Keep up the good work, you're on the way to being one of the best in the area! !